The Jap Box or "Japanese Handkerchief Box" is a simple rectangular box without a lid and a removable bottom. The bottom has a hole in the center to facility its removal from the rest of the box. The basic effect is that the box is shown empty by showing it from all sides as well as removing the bottom. Then the bottom is replaced and silks appear in the box. Producing silks is just the very beginning of possibilities with this prop. 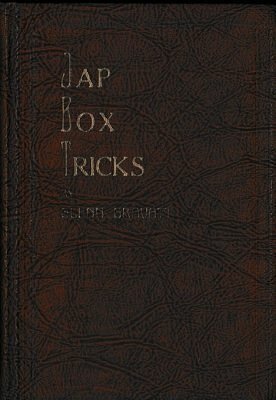 This ebook describes many other things that can be done with the basic version of the Jap Box. It is unclear where this trick originated. It is believed that the first version was manufactured in Germany from metal. At some later point somebody attached the 'Japanese' label to it, probably to make it sound more mysterious. Regardless of its origin, it is a classic magic prop with lots of possibilities. 1st edition 1937, 123 pages; 1st digital edition 2016, 52 pages.